It’s official. No one can agree on the best time to start the school year. A recent report from the NC General Assembly’s Program Evaluation Division (PED) found that certain start dates are favored more than others, but none poll at a rate high enough to say with certainty that one is the best. Different groups have different opinions. 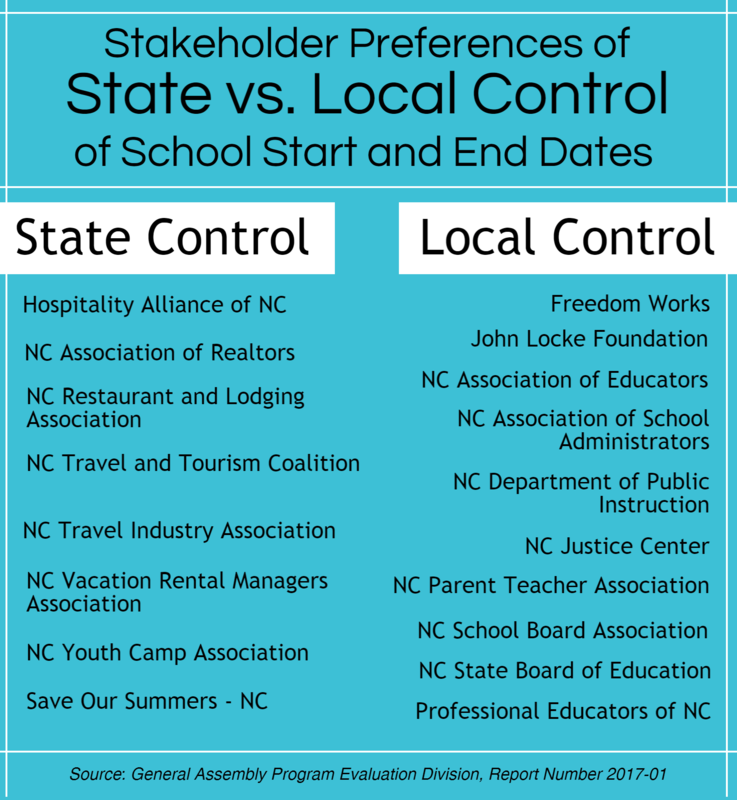 Ask the travel and tourism industry and Save Our Summers – North Carolina and they want school to start as late in August as possible, or even after Labor Day, and to end as early in June as possible. Ask the local school boards, summer camp operators, and community colleges, and they agree that K-12 schools should start early enough to allow for high school mid-year finals to match the community college and college calendars which means the semester would end before December break instead of mid-January. North Carolina is one of only 14 states with a state law stipulating when the school year should start, but only Maryland and North Carolina dictate the end of the school year. The school calendar law, which was first enacted in 2004 and most recently revised in 2013, requires schools to start no earlier than the Monday closest to August 26 and end no later than the Friday closest to June 11. Schools must also be in session for 185 instructional days or 1,025 hours (which is about 5.5 hours per day). The strict start and end dates have created a few problems for local schools districts to fit the school year into the prescribed dates while still giving adequate vacation and holidays, providing enough teacher workdays, and matching the community college calendar. The problem doesn’t affect year round, modified calendar, or public charter schools because the law only restricts traditional calendar schools run by Local Education Authorities (LEAs) such as Wake County Public School System. The current traditional school calendar forces high schools to end their first semester in the middle of January, which worked for decades. More recently, however, high schools have made strong academic connections with two- and four-year colleges whose first semester ends in mid-December. Of those surveyed, 94 percent of North Carolina superintendents indicated that is was either “very important” or “extremely important” to schedule the first semester exams before December break, and 85 percent of them deemed it very or extremely important to align the calendar with community colleges. High school students who are dual-enrolled in high school and post-secondary classes are stuck between two calendars. They report having difficulty in January with keeping track of finishing one semester in high school while beginning a new semester in their college courses. High school teachers said report that they favor finishing the first semester in December, too. They believe the December break affects outcomes on the mid-year and final exams in January because too much time has passed between learning and testing. The issue isn’t unique to high school, though. Students in middle and elementary schools would also benefit by having the second quarter end before a major vacation as well. They could come back refreshed and ready to start the new year with a new marking period. Priorities for scheduling the start and end dates of the school calendar differ from region to region, and even between school districts. What doesn’t differ is the opinion of superintendents. As mentioned above, they are almost unanimous in ending the first semester in December and in granting local school boards the authority over school start and end dates. 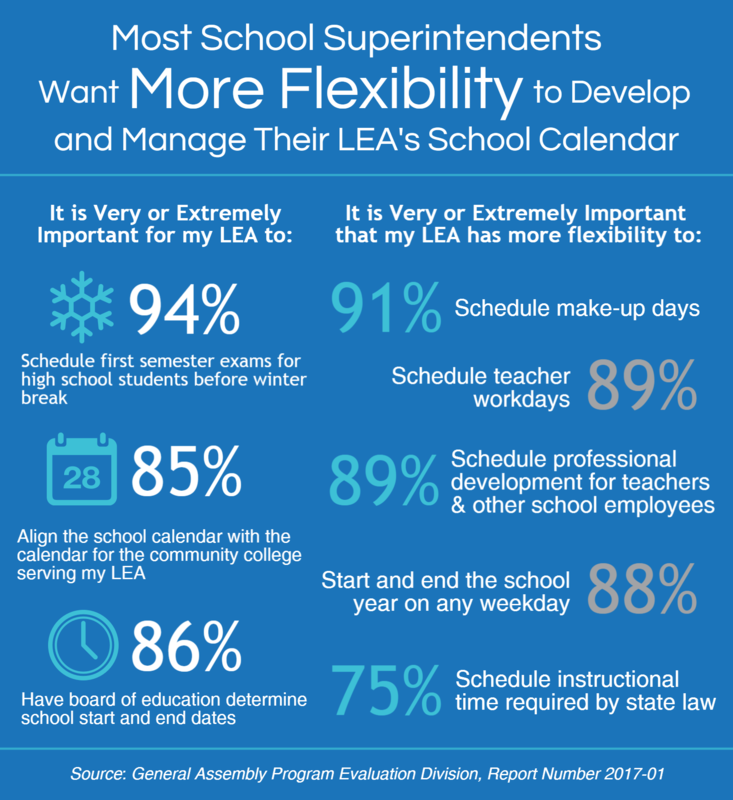 Similarly, 86 percent of the superintendents rated it very or extremely important that the local school board be able to determine the start and end of school, 88 percent want to be able to start or end on any weekday, and 89 percent want the flexibility to schedule both teacher professional development and teacher workdays within the school year. On top of that, as of this writing, more than 50 LEAs have filed individual bills in the General Assembly request local control over their school calendar. It’s rare that any group has such high rates of agreement, and since these folks are running our state’s 115 LEAs, shouldn’t we listen to them over private organizations with business interests? That’s not to say those business owners needs aren’t important. For some, the summer vacation season makes the difference in the year’s bottom line, especially those businesses who rely on tourist dollars. The PED took that into consideration when it surveyed parents statewide. The parents were asked when they preferred to take vacation, and July came in as the most popular at 22 percent. That was followed closely by June at 20 percent. August trailed significantly at 13 percent. The winner in this question, however, was “No Preference” at 41 percent. This means that just as many parents will choose June or July as parents who will choose a summer vacation time that fits their needs as a family whenever school is out of session in the summer months. This is important information because the argument among tourism advocates and Save our Summers – North Carolina was that school start should be as late into August as possible, which is why the start date is “no earlier than the Monday closest to August 26.” This later start date would give families the chance to spend their vacation dollars well into the summer and very close to the Labor Day holiday as possible. Not only does the data refute the tourism industry’s argument, any parent of school-age, traditional calendar children knows that the second week of August is when summer leisure starts winding down because the school supplies and clothing sales are fully under way. Families are spending more time in the aisles of Wal-Mart than on the islands of the Outer Banks. Not only are vacations not scheduled later in August, but parents also preferred an earlier start of the school year. 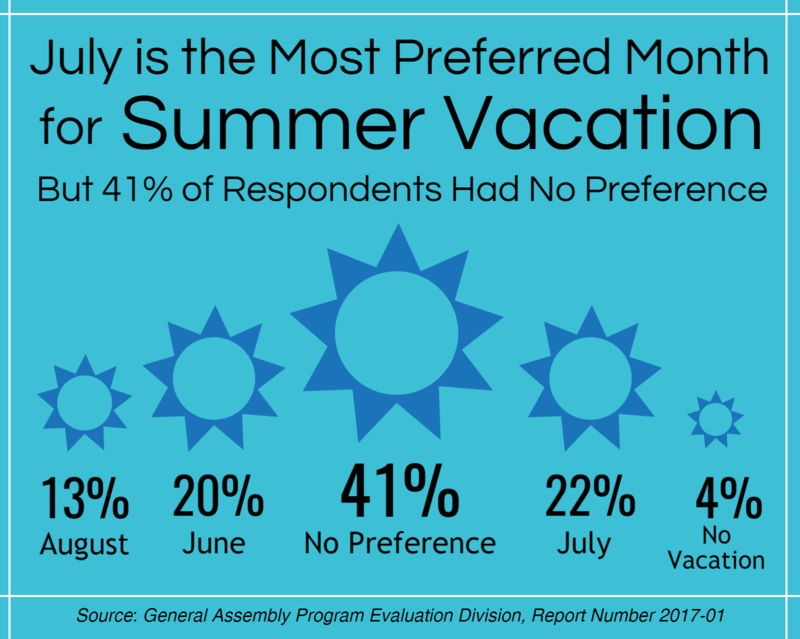 The same parent survey by PED found that 52 percent of the respondents preferred a school start date within the first three weeks of August, despite the 13 percent of parents who preferred an August vacation. And the most popular week among those three choices was the second week of August. The last week of August polled at just 13 percent. Starting school earlier in August, and keeping the kids in session for 185 days would mean the school year would end around May 31 each year, giving families all of June and July off, which were the two most popular months to take a summer vacation. So between superintendents who want their school calendars to match the community college calendar and parents who prefer a start date in the second week of August, the opinions of the primary stakeholders of public education are matched as well. They prefer starting school earlier in August. Trying to get a consensus on the start and end of school between schools and private industry is like trying to get everyone in a large group to agree on pizza toppings. What if everyone could order their own pizza their own way? Chances are that even with the option to order “anything” people would still choose just a few variations. For example, someone might get sausage and green pepper and another might get sausage and onion. A few toppings match and few are different, and those who like one or both toppings can share with others so that very little goes to waste. That’s the beauty of local control. If state calendar law were changed instead to give LEAs flexibility to set the calendar based on the number of days and/or hours of the school year, then local districts would have the freedom to set their calendars based on factors unique to their districts. Some districts might need to start after Labor Day because of the tourism industry or late summer harvest while others would need to start well before to make sure their high school matched the community college calendars or to make room for expected inclement weather days. In the case of WCPSS, an earlier start to the school year solves many problems. At the high school level, students won’t be caught between two calendars when they are dual-enrolled, and teachers will have more accurate data about first semester learning. At the elementary and middle school levels, students will start the new calendar year in January with a new marking period instead of carrying over work from a two-week vacation. Local control would grant the WCPSS School Board the flexibility to build in more days for professional development, teacher collaboration, and inclement weather makeup. This may make for a longer year from start to finish, but with some days built in for long weekends for students it will give the kids a brief break from learning and the teachers will have a chance to meet with colleagues, focus on improving their instructional practices, and plan more engaging lessons. What WCPSS does may not work for all districts, however. Some LEAs may prefer to start the school year a bit later and front-load their teacher professional development. That’s the point. The current law is a one-size-fits-all. It appeals to interests that don’t have a place making education policy while trying to meet a minimum requirement of school days. It jams those instructional days into the shortest window possible without considering the stamina of students and teachers alike. That’s why WakeEd advocates for local control on school calendars, as it did on setting class size for Grades K-3. The state should set the calendar law to a minimum number of instructional hours, such as the current requirement of 1,025 hours, and add guidelines that local school boards should set school to 185 school days with the ability adjust the number of days depending on the timing of public and religious holidays. The revised law could also say that “every effort” should be made to end school on or before June 15, but it is unlikely to be necessary. This type of local control would give superintendents the flexibility they desire, it would make it easier on students at all levels who can start fresh in January, and it would give parents the ability to schedule their summer vacations in the months when they already prefer to travel. Of course, it would reduce the amount of family travel in the later weeks of August, but it’s possible that families might travel during the school year on the long weekends of teacher work days. The purpose of setting the school calendar should be to best meet the needs of students and teachers, not the tourism industry. State lawmakers who campaigned on being champions of public schools should step forward and change the rigid state school calendar law to the benefit of the people in the schools: the students. If North Carolina truly wants to be a state that values education, the General Assembly will make the change this year so it will take effect in the 2018-19 school year. How do you feel about the school calendar law? Answer our brief survey.